a. Those who had individual plots in the prior year and have met their garden obligations will be assigned the same plot for the coming year if requested. b. New gardeners will be assigned an available plot in the order of their requests. 2. Gardeners are encouraged to donate ten percent (10%) of their harvest to local food banks. The balance of the harvest from individual plots belongs to the plot owners. All members of the garden association may share in the balance of the harvest from common areas. Produce from the garden may not be sold. 3. Organic and inorganic fertilizers may be used, though organic are preferred. Only organic pest and herb control can be used—no insecticides or herbicides. 4. Help with common areas is required. Each gardener is expected to contribute at least five hours of work on common areas each year. Work parties and tasks will be announced, and a log book will be kept in the equipment shed for recording hours. 5. Individual plots must be tended regularly throughout the year, including at least weekly removal of weeds, watering, and harvesting in season. If a plot is untended for more than two weeks during the regular season, March 1-Nov 1, the owner may be given notice to correct by a particular date; if the problem continues, the plot may be reassigned to someone else without a refund of fees. 6. Cooperation with neighboring gardeners is necessary. Trees are not permitted in individual plots. Tall or trellised plants should not shade neighboring plots; spreading plants must be kept within individual boundaries and out of the paths. Raised beds are allowed, but must be removed by the owner when the plot is reassigned if requested. 7. Water use and conservation are important. Water must be turned off before leaving the garden. No water timers are allowed. Watering should be limited to the owner’s plot, unless permission is given by others. 8. Community tools and equipment cannot be removed from the garden, and must be returned to the tool shed in a clean condition, and the tool shed locked. 9. 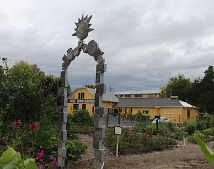 The individual garden fee is $50 per year, which includes the right to participate in cultivating and harvesting of the common areas, to participate in meetings and decision-making regarding the garden, and the right to water, cultivate and harvest an individual plot. Individuals and families for whom the full fee would be a hardship may request a waiver of between $10 and $30 per plot. 10. No dogs are permitted in the garden. Children are welcome, as long as they are closely supervised to avoid damage to neighboring plots and common areas. Out of respect for other gardeners, please do not smoke in the garden.